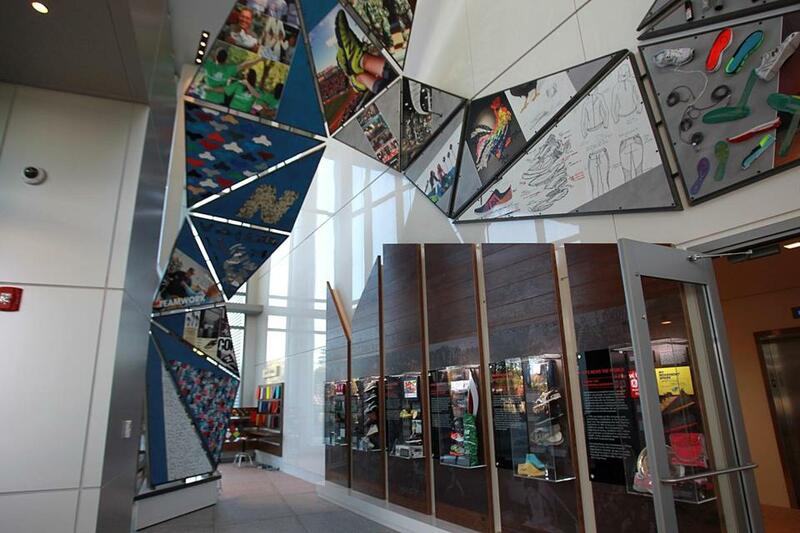 The Visitor Engagement Center includes a sculpture meant to remind visitors of a chicken’s foot, the model for perfect balance to the brand’s founder, William Riley. Interactive media, communal workspace, and direct views of Boston are some of the perks New Balance is counting on to attract young workers to its new world headquarters in Brighton. 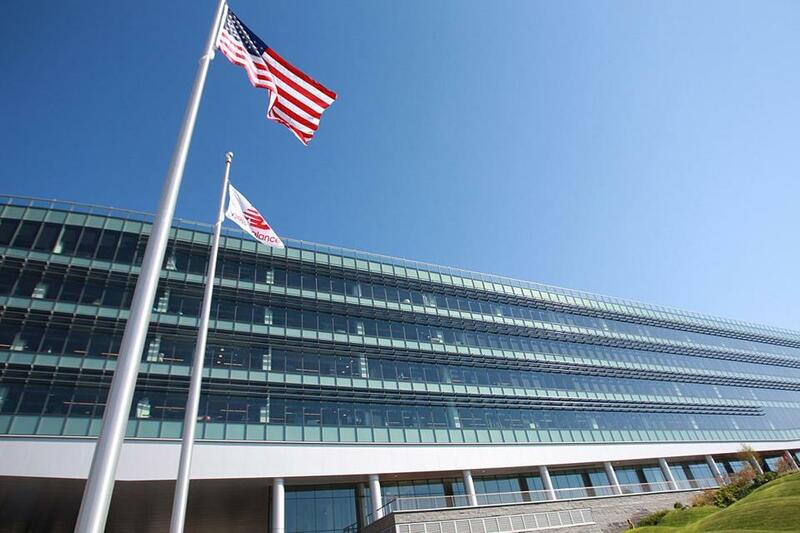 New Balance has moved about 700 employees into its new 250,000-square-foot building at the 15-acre Boston Landing development. The old headquarters, a short walk down Guest Street which is parallel to the Massachusetts Turnpike, will be occupied by Harvard Business Publishing. When TripAdvisor opened new headquarters in July 2015 in Needham, it built the facility to attract technology hires. DeMartini said New Balance will add about 100 corporate employees each year, particularly from the 25- to 30-year-old demographic. Since making the move, employees who attended the tour said they appreciated the openness of the floor plan, which is geared toward working together. The New Balance world headquarters is the first part of a multiphase project to create a health and wellness district, said Erin Harvey, leasing and marketing manager at NB Development Group, the company managing the development of Boston Landing. Currently under construction is a new Boston Bruins practice facility that will seat 600 fans, set to open in September 2016. A commuter rail station, multisport event center with a raised track, retail space, a hotel, 275 residential apartments, and two more office buildings will also be built by summer 2018. Founded in 1906, New Balance made its first pair of running shoes in 1938. James Davis bought the company in 1972, and has grown the athletic brand into a business with $3.3 billion sales worldwide in 2014. New Balance decided to move about six years ago to its fourth headquarters in 35 years, and broke ground in September 2013. David Manfredi, founding principal at Elkus Manfredi Architects who designed the building, said he has heard the shape of the building looks like a shoe, a cruise ship, or animals. He thinks this is great because people see what they want to see. “It’s about motion and speed, performance and achievement,” Manfredi said. New Balance has moved its world headquarters to 100 Guest Street in the Boston Landing development in Brighton. 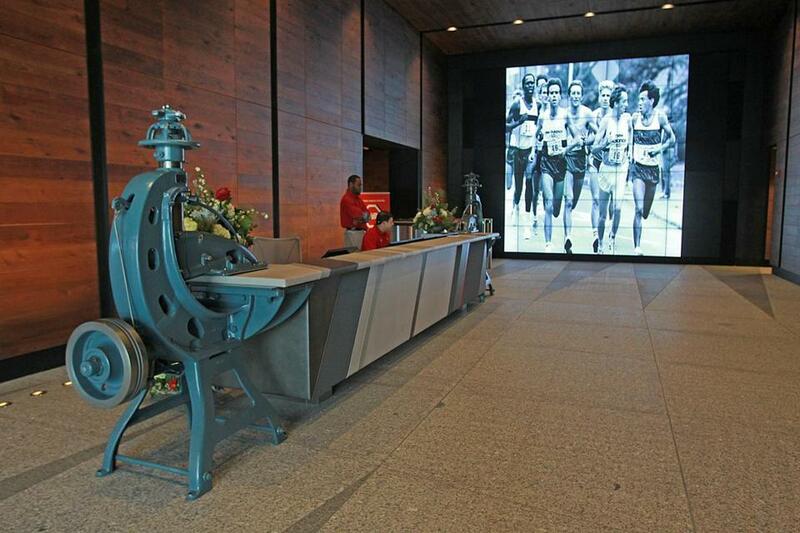 The lobby area of New Balance’s new headquarters features a large electronic display. 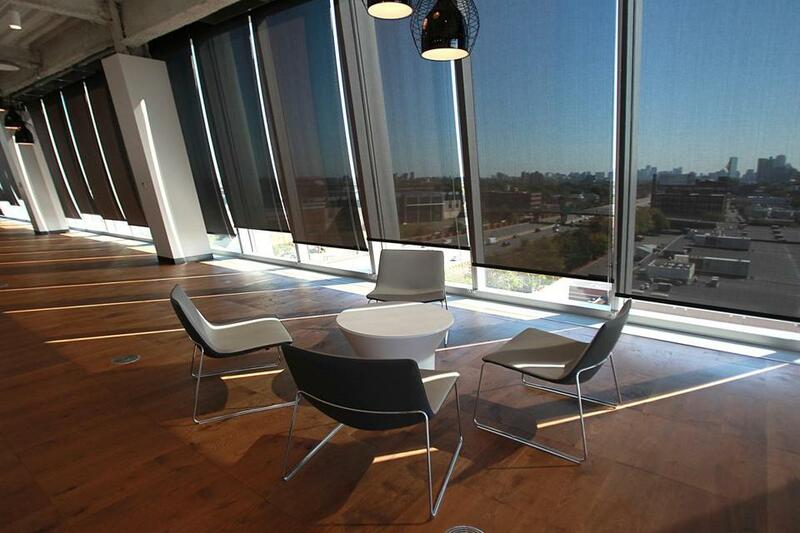 The fourth floor of the headquarters includes meeting rooms and looks out over downtown Boston. 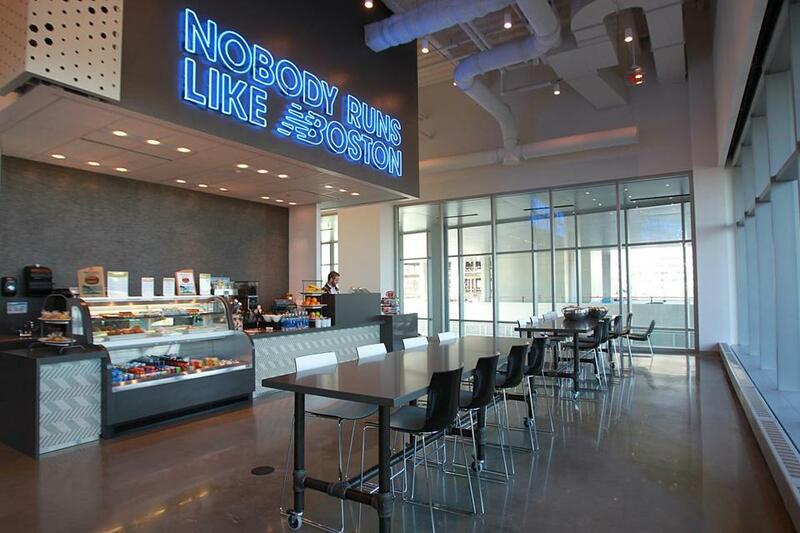 The coffee shop at the New Balance headquarters includes the neon “Nobody Runs Like #Boston” sign, the phrase created after the 2013 Boston Marathon. 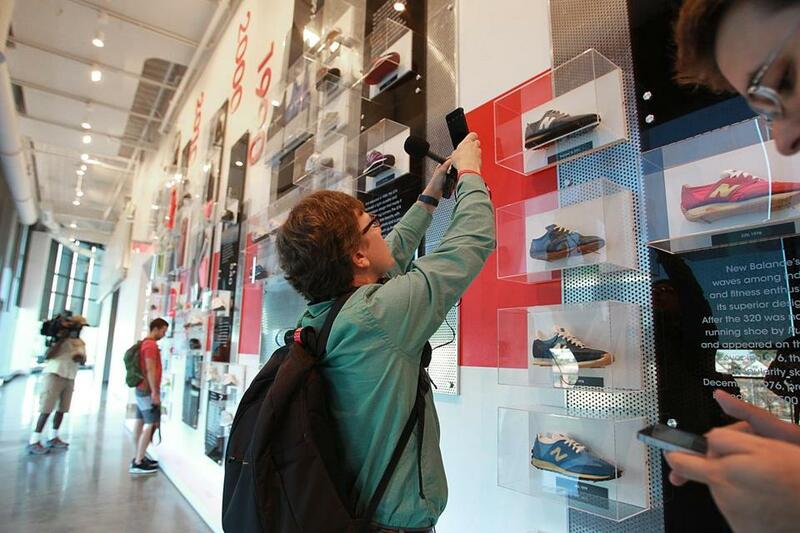 On the wall between the cafeteria and coffee shop is a wall of history with New Balance shoes from 1938 until today. 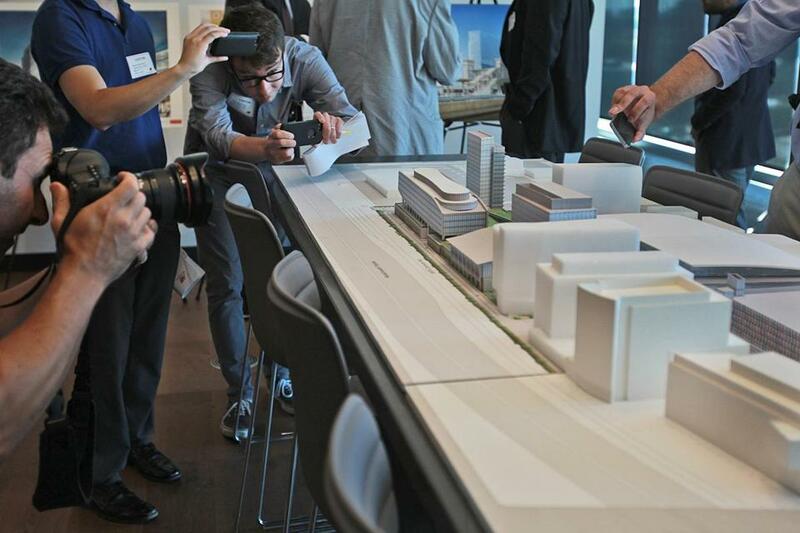 The Boston Landing development, modeled here, encompasses 15 acres and includes plans for a Boston Bruins practice facility, a multisport indoor event center, a hotel, retail space, and apartments. 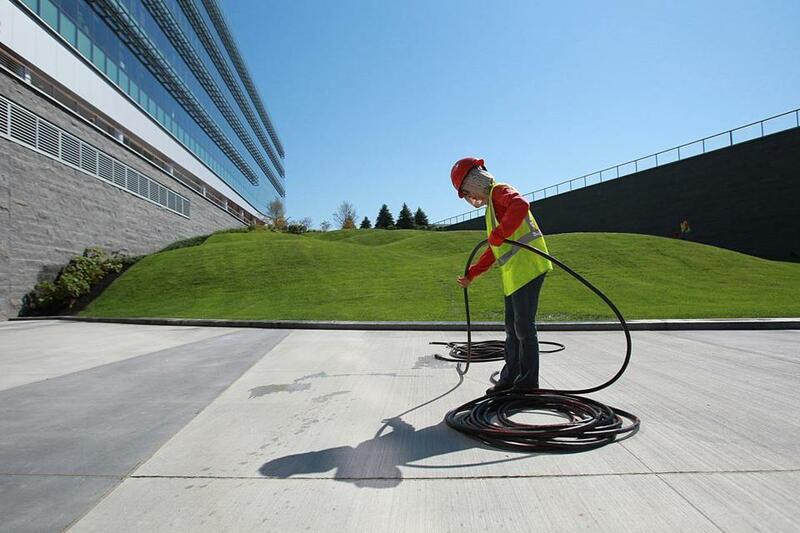 Part of the lawn outside the New Balance building was desiged with undulations, or moguls, for employees to lean back on as they converse outside. Jessica Geller can be reached at jessica.geller@globe.com. Follow her on Twitter at @jessicageller57.